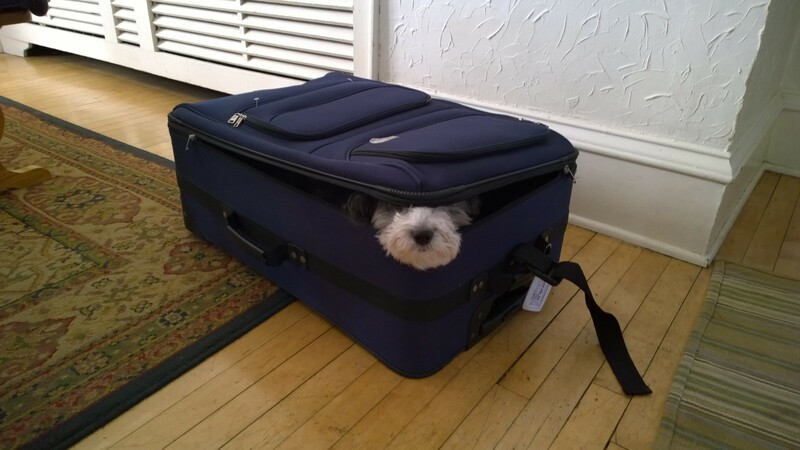 Home Blog Can you coax a dog out of a suitcase? I’ve got to catch a flight to Israel! In just a few hours, I’ll be heading to Chicago O’Hare International Airport, where I’ll meet Jill, the Public Relations Director for the Midwest Region of the Israel Ministry of Tourism. Together, we’ll take a 9 1/2 hour flight to Rome, and then a 3 1/4 hour flight to Tel Aviv. We will, that is, if I can convince Ms. Daisy to get out of my suitcase! Poor baby, this past week has been agonizing for her. She knows that when the luggage comes out, I’ll be leaving. As far as she’s concerned, this is NOT cool. But for me, it’s very cool. Jill and I are traveling a day ahead of the rest of the group, which will give us an extra night in Tel Aviv and allow us the privilege of welcoming the other Catholic journalists when they unboard the next morning. After that, the fun (and hard work) begins! Bethlehem, Nazareth, Cana, sailing on the Sea of Galilee, a press event with Pope Francis, a reception for the Holy Father at the Israeli Prime Minister’s house in Jerusalem, and, of course, the historic meeting between Pope Francis and Patriarch Bartholomew I are just a few of the experiences I’m looking forward to sharing about with you. Of course I’ll be posting all about it here, on MargeFenelon.com, but you’ll be able to read more of my adventures at Our Sunday Visitor, National Catholic Register, and CatholicMom.com . Additionally, I’ll be chatting live from Jerusalem with EWTN’s “Son Rise Morning Show” host, Matt Swaim at 6:45am EST on Friday, May 23 to preview the weekend’s big events. Then, I’ll chat with Relevant Radio’s “Morning Air” host Sean Herriot at 5am EST on Tuesday, May 27th to summarize the Pope’s visit and give my take on ….well… everything. You can find me on Twitter and Facebook where I’ll sharing my in-the-moment impressions. I’ve got a different approach for each medium – this will be SO exciting! In the meanwhile, it’s time to coax Ms. Daisy out of my suitcase and fill it with all the things I’ll need to trek Israel for the next ten days. Please pray for me, and I’ll pray for you!